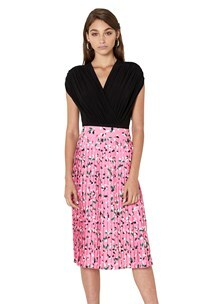 Bright, flattering and fun, this midi skirt is an exciting season essential to add to your Summer wardrobe. Sitting straight across the chest, with thick statement straps, this dress sits snug on the body finishing just below the knees. The Cross-over Nectar Dress features a gathered frill that cascades down one side of the body into a wrap styled skirt which creates a high split. 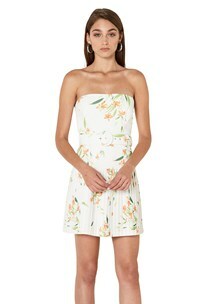 The dress is made from rayon crepe and features a chunky metal zip for access.